Have your children discovered the joys of Lift-the-Flap books? 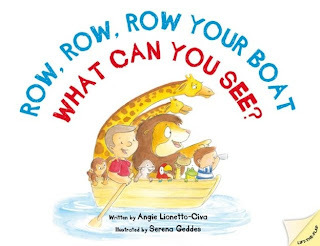 Row, Row, Row your Boat is such a cute one, written by Angie Lionetto-Civa, illustrated by Serena Geddes, and published by New Frontier Publishing (2010). Sitting comfortably in a little row boat, a boy looks through his spyglass and spies many exciting animals in the forest. Each animal joins him in the boat as they set off for an exciting day on the river. Children will enjoy finding all the different animals hiding under the flaps. Look out for the crocodile! 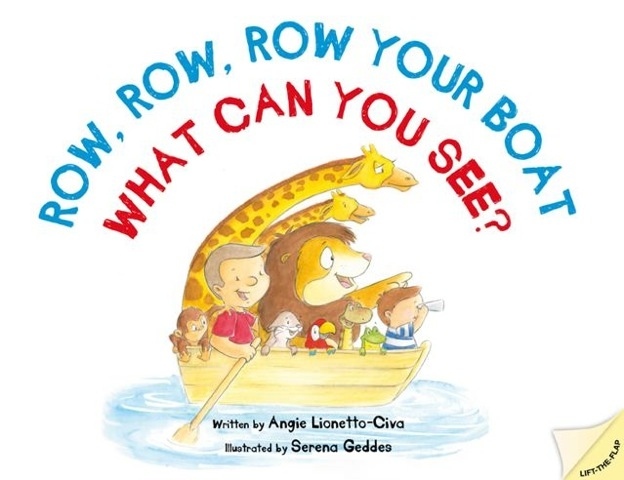 Will the little boy make it safely to land with his row boat full of friendly forest animals? It's a simple concept, making it ideal for kids under four. Take a song that most little ones know and love to sing, and innovate on it by changing "life is but a dream" to "what can you see?" When children lift the flap, they see all sorts of rhyming animals which get added to the boat. There's a tense moment when we meet a crocodile, but all ends happily. Geddes' soft and gentle watercolour illustrations add to the atmosphere of fun and safe adventure. The book lends itself to movement. Can't you just see babies being rocked back and forth in time with the rhythm of the words? Or toddlers enthusiastically rowing and adding animals to their boats? Older children will love to create their own new verses of the song, or even go on and design their own Lift-The-Flap books.